Parsley, Cilantro, Sweet Corn, Cherry/Grape and Regular Tomatoes, Salad Onions, Beets, Salad Mix, Summer Squash, Sweet Peppers, and Kale. I got there early this week so I didn't have any issues with people with sticky fingers. The corn at Honey Brook is amazing. Seriously. The best corn I've ever had. They literally cost 10 times what the corn at the grocery store is going for, but I want to say it's worth it because it's really that much better. Super crisp and so sweet. I cook them for 1 minute on high pressure in my Fagor Lux Electric Pressure Cooker with 3/4 of water. When it's done, do a quick release of the pressure and voila! So much easier and faster than boiling a big pot of water. I don't know what's going on with the PYO. I haven't really looked into it. I'm rather disillusioned with that whole process. I was so excited to be part of a CSA and while I think the value is there, and I whole heartedly believe in CSAs and I think everyone should join one, this might have just been the wrong one for us. But it's hard to find organic farms near us. There are also no good farmer's markets...except for one at Rutgers that is only open during the day on Friday (wtf is up with that? So regular working folk can't have access to the produce?). There are also very few farms that don't support animal agriculture. There is one that's run by vegans but it's way up North. 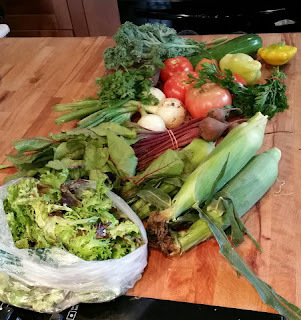 When it gets to be time to join a CSA, I'll make up a chart and share it on here, listing who's doing it and whether they're vegan-friendly, organic, etc. Until then, hope you're all enjoying your summer.